Manish Patel gained his undergraduate degree in physics from the University of Kent, and went on to study a PhD at the Open University working on the Beagle 2 mission to Mars, where he designed, built and tested a UV sensor to measure the sunlight at the surface of the red planet. He then went on to work as a postdoc on the Cassini–Huygens mission, which is the first mission ever to land on Titan, the mysterious moon of Saturn. Manish then won a UK Space Agency fellowship, allowing him to build a career leading his own group and spaceflight instruments. 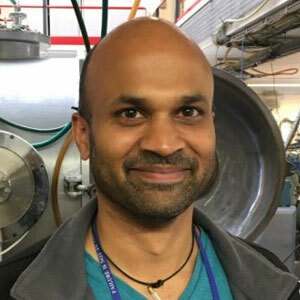 Manish’s main research interests revolve around the atmospheric and surface environment of Mars, and he currently co-leads the NOMAD instrument on the ExoMars Trace Gas Orbiter, as well as participating on several other instruments exploring both Mars and the moons of Jupiter. He is currently the President of the Astrobiology Society of Britain, and holds a joint appointment at the Open University and Rutherford Appleton Space Laboratory in Oxfordshire. The presence of dust in the martian atmosphere has long been a familiar, yet alien concept. Dust ‘events’ occur on Mars at varying scales, from gusts of wind blowing a cloud of dust across the landscape to regional dust storms, and in the most extreme of cases leading to storms that engulf almost the whole planet, known as ‘planet encircling dust storms’. 2018 saw the growth, peak and recession of such a planetary-scale dust storm, and here Manish Patel presents the observations made by the ExoMars Trace Gas Orbiter and the Mars Reconnaissance Orbiter of the dust storm and its evolution. European AstroFest is organised by Astronomy Now, the UK’s biggest astronomy magazine. Since 1992 it has grown into Europe’s premier astronomy and space conference and exhibition.